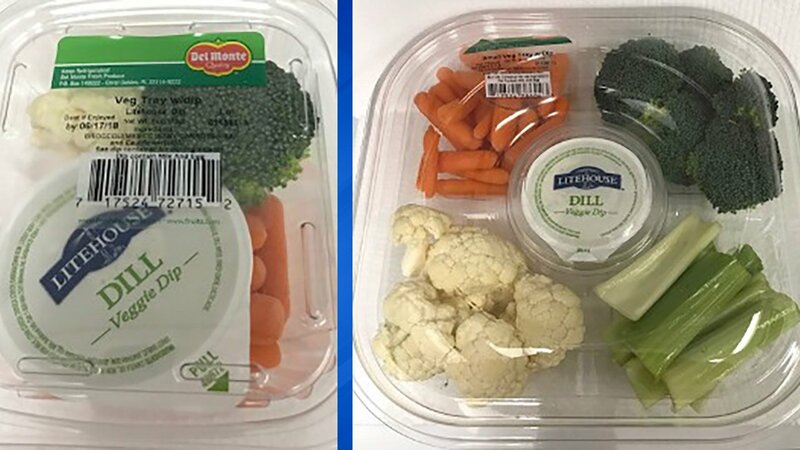 Del Monte is recalling 28 ounce "small veggie trays," which include broccoli, cauliflower, carrots, celery and dill dip, that were distributed in Illinois, Indiana, Wisconsin, Michigan, Iowa and Minnesota, after officials investigate a cluster of cyclosporiasis, an intestinal illnesses. The Illinois Department of Public Health (IDPH) recommends throwing out the vegetable tray if you have already purchased it. No illnesses have been reported in Illinois. Cyclosporiasis is an intestinal illness that can cause diarrhea, loss of appetite, weight loss, stomach cramps/pain, bloating, increased gas, nausea, and fatigue, according to the U.S. Food & Drug Administration. Vomiting, body aches, headache, fever, and other flu-like symptoms may be noted. Some people who are infected with Cyclospora do not have any symptoms. If not treated, the illness may last from a few days to a month or longer. Symptoms may seem to go away and then return one or more times (relapse). Del Monte reports the recalled products (6, 12, and 28 ounce vegetable trays containing broccoli, cauliflower, carrots and dill dip) were distributed to: Kwik Trip, Kwik Star, Demond's, Sentry, Potash, Meehan's, Country Market, FoodMax Supermarket, and Peapod in Illinois, Indiana, Iowa, Michigan, Minnesota, and Wisconsin and have "Best If Enjoyed By" date of June 17, 2018 or earlier. Only 28 ounce vegetable trays were distributed in Illinois.